Sunny, radiant Aquarius-Rooster — the very charm. People are drawn to this bright, slightly eccentric person. He is not bored with him: he is sociable, intelligent, thinks broadly and freely. The union of a bright Rooster and irresistible Aquarius gives rise to an unusually interesting, and most importantly, charming man. On a combined horoscope, Aquarius-Rooster is an extraordinary, intriguing personality. From the people of this combination, you can expect just about anything: they are not afraid to dream, they sincerely believe in their ideals. Energetic, resourceful Rooster-Aquarians are full of ideas, without fear, embark on the most ambitious projects. At the same time they find time for their friends — they are sincere, sensitive people, able to understand any person. Decent and honest Aquarius-Rooster speaks only the truth: he has nothing to hide from others. He does not know how to lie, and does not see the point. After all, his opinion is so valuable that they can not be neglected, at least he believes in it. He thinks not eccentrically, he is not afraid to be called an eccentric. Clearly knows what he wants from life, is deeply committed to his principles. Rooster Aquarius once engaged in intrigue: his head is full of brilliant ideas. Do not expect meanness from people — this is an incorrigible idealist. Often confronted with a misunderstanding of others: it is difficult for them to follow the course of his thoughts. Too unordinary and unpredictable in order to comply with generally accepted norms and rules. Aquarius-Rooster thinks so progressively that he is ahead of time. Aquarius-Rooster is an individualist, original in all: clothes, way of thinking, behavior. Do not be afraid to express yourself, do not hesitate to be different from others. The inquisitive mind pushes him to bold experiments: he strives for an ideal, of course, in his understanding. He likes bright, provocative outfits — looks stylish and effective. Rooster-Aquarius has a developed aesthetic taste, is well versed in fashion. He likes to shock the public and deliberately draws attention to himself: he combines incongruous things. It looks dignified, always surrounded by people. It causes admiration, envy, and sometimes bewilderment. Strong, strong-willed Aquarius-Rooster does not pay attention to oblique glances, but boldly goes through life. Sincere and generous Rooster-Aquarius can not pass by someone else’s misfortune. Does not differ in arrogance, does not like proud people. He behaves friendly with all, tries to help, even if he does not have excess time or money. Constantly busy with important things: somewhere in a hurry and running, trying to catch up anywhere and everywhere. And he does not always represent the ultimate goal of the event. Curious without measure: he is interested in everything in the world. The main feature of the sign Aquarius-Rooster is an inquisitive mind and a developed imagination. This explains his desire for research, his desire to embrace the immensity. Rooster Aquarius lives in his own world — it is a supporter of advanced ideas. Not everyone shares his progressive views, but eventually realize that he was right. Cheerful, sociable Aquarius-Roosters are always in the center of attention, around them there are a lot of people around. Sometimes especially impressionable natures take their courtesy for something more, for example, falling in love. However, non-permanent Aquarius-Roosters can not, and do not want to commit themselves. On the love horoscope Rooster-Aquarius is a freedom-loving, independent person. Only extraordinary circumstances can stir him into marriage: a strong feeling, deep affection. Having married, Aquarius-Rooster devotes herself to the family. This person knows how to be not only a playful merry fellow and an incorrigible romantic, but also an earner. He devotes a lot of time to the arrangement of everyday life, rather skillfully leads a household. Betrayed to his half, does not wait for deception on her part. Painful betrayal. Despite his fervent disposition, Rooster-Aquarius needs support. He is too busy with work and household chores - he is very tired, but he is afraid to admit his weakness. The active Aquarius-Rooster will not rest until he realizes all his ideas. It has not only a rich imagination, but also a strong will: it is able to translate the wildest dreams into life. He is attracted by activities related to creativity. Among the Aquarius-Roosters you can meet representatives of the most diverse creative professions: singers, actors, artists, writers, writers. People of this combination have an acute mind, they have great abilities for research. They can become ingenious inventors and scientists, for them the main thing: serving the interests of society. Aquarius-Rooster, like any gifted person, has a peculiar way of thinking. Sometimes he can not cope with the simplest work: a monotonous, monotonous activity causes him yearning. This person can become a talented leader or a successful businessman, but he will never follow strict rules. Much more efficiently works, if he does his favorite thing and does not obey anyone. Do not tolerate instructions, do not follow other people’s advice. Aquarius-Rooster is suitable for working with a free schedule, he should try his hand at entrepreneurship — success is guaranteed. 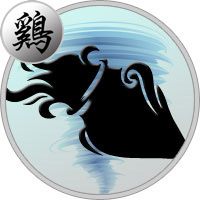 The strong character of the Aquarius-Rooster man allows him not to fall for life’s difficulties. Always knows how best to do in a given situation. Surrounded by numerous friends who sincerely want to help, at least with advice. He is a confident person, ready to challenge the whole world. In a romantic relationship, he shows herself as a gentle romantic boyfriend. He arranges original meetings, tries to impress the chosen one with his fiction and fantasy. But do not expect help from him in solving domestic issues. Having achieved reciprocity, can switch to work. This is a real fanatic of his business, especially if it’s a creative work. Aquarius women, born in the year of the Rooster, is perceived by society as a great original. In any way they try to stand out from the crowd. They love bright clothes, they are not afraid to combine things of different styles. Do not recognize the framework in creativity, often these are talented artists, writers or actresses. They are very far from all earthly things, but they can create quite tolerable living conditions for their families. Aquarius-Rooster is a strong-willed woman with a strong character, therefore everything is subject to her. Freaky, original, freedom-loving person can eventually become an ideal housewife. She prefers men who are not deprived of talent, but still firmly on the ground.